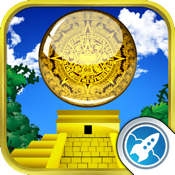 Aztec run is a simple and fun falling game. Enjoy playing the old-fashioned but still addictive gameplay. Imagine yourself a golden ball jumping from one platform to another trying not to crash. The game has two control options. Use arrows or tilt to surf through platforms, trying not to hit the spikes.